What Do You Do If Your Job Isn’t Real Yet? On this #DamnItCarl podcast B.C. 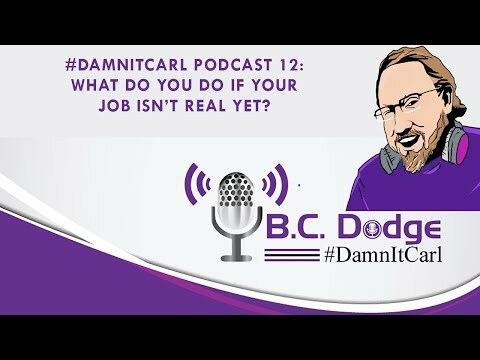 Dodge asks – What do you do if your job isn’t real yet? B.C. saw a tweet from Intel this week that said some jobs that will be needed in 2030 haven’t even been invented yet. This is a life lesson that B.C. has tried to teach his kids over and over again. As a digital marketer that graduated high school in the 90s, it is fair to say that social media was not really a thing yet – to be honest AOL chat room were not even popular yet. And where B.C. graduated from…they really didn’t even have the internet yet. He spent a lot of time in the guidance office struggling to figure out what the rest of his life was going to be about. But at that time being a digital marketer wasn’t a thing. It was a topic, and it wasn’t something you could study to do. B.C. fell into what he was good at in the early 2000s, but that left almost 20 years where he struggled to find his place in the world, but he couldn’t because it hadn’t been invented yet. The point that he tries to drive home is if you are a teen struggling to figure out what to study, don’t hurt yourself. Because the what you might be good at, what you have a natural talent for, might not even have been invented yet. Is it a Hobby or a New Career?